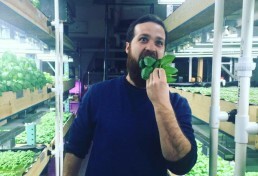 Learn all about Miles Cretien and his 12 steps for starting up an Aquaponics Farm in Brooklyn, New York. As fish eat and grow, they release ammonia into the water through their gills and digestive system. Without export, ammonia levels will quickly become toxic and poison the fish. In order to remove ammonia and keep the fish alive and healthy, we use bio-media filters to process the ammonia into nitrates, a far less toxic chemical to fish. However, if nitrate concentrations get to high, they too can poison the fish over time. Therefore we need a third mechanism to remove nitrates from the water to ensure the fishes good health. This is where plants come in. Plants use nitrogen compounds to form proteins for cell growth. Without some form of nitrogen, nitrates in this case, plants will suffer from stunted growth. Thus we can use plants to remove the nitrates from the system and provide clean, ammonia and nitrate free water, for the fish. Verticulture is awesome and has great plans to make this world a happier and helthier place. KIKVORS will be making more documentaries about Verticulture in the future. Yet Urban and Vertical Farmers like their knowledge like they like their produce: Fresh. Therefore, to be up to date follow them on facebook.